As the train pulled into the station at Arles on a mild November morning, I found myself entirely unprepared. 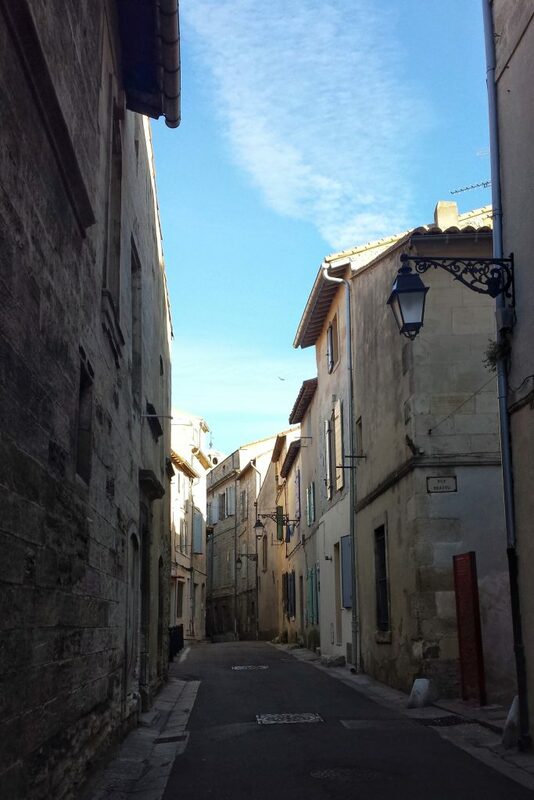 I’d set off for a day trip to Arles from Montpellier on a whim, intending to go where the wind blew me, finding joy in discovering things for myself, a true flâneur. Usually I do more planning, but it had been an extremely difficult few months, and I was exhausted. I knew Van Gogh had lived in Arles for a time, had painted prolifically, cut off his ear, and was institutionalized in the asylum. However, I didn’t have a map or know where to find the places he’d painted. I recalled reading there were none of his paintings in Arles so I had no hope of seeing one (see Travel Tip section below, this has since changed); but I still wanted to see the scenes he’d painted, visit the Arles Roman Amphitheatre, and wander in a charming little town in Provence. An elderly woman in a red sweater set off to the left pulling a wire cart. Figuring she must be going to the Saturday market, I followed her at a slow pace, hoping to remain undetected. Unknowingly, she led me past a small, sleeping carnival, along the Rhône River wall, down shaded morning streets, and into the Place de la République, the main square in front of the town hall. The streets were already busy with shoppers and a small sprinkling of tourists though it would surely be packed with them in warmer months. At this point I could figure things out for myself, and the lady in her red sweater continued on. I took my time, imagining Van Gogh treading on the cobblestones beneath my feet. Strolling slowing, I enjoyed the narrow lanes lined with little shops and row houses, many with picturesque shutters, and a flower box or two. 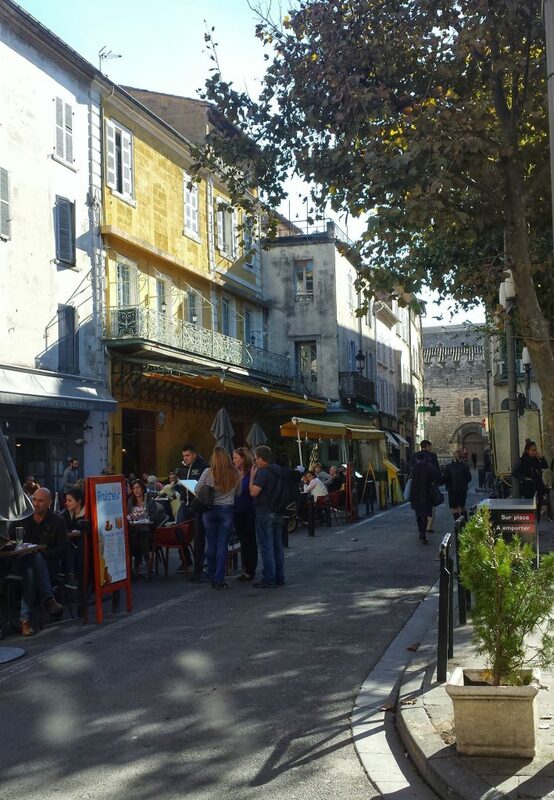 After a time, I entered the Place du Forum and discovered the yellow cafe that Van Gogh painted, Café Terrace at Night. Spotting a free table on the terrace of a cafe at the end of the square, at roughly the same vantage point as the painting, I settled in to contemplate the view. Had Van Gogh sat here himself? While enjoying a coffee, I watched locals greet one another as they passed, some stopped to chat briefly and continued on, others settled in for a coffee and a visit. It seemed like a mix of people whose families had lived here for generations and late-middle aged expatriate artists. A family entered the square, the daughter recognized the cafe and a big smile erupted on her face. She pointed wildly and called to the others, excited to be the first to see it. The late autumn sun felt good on my face; in no hurry, I lingered a while. What would it be like to live in a small town like this, to pass by tables and know everyone? I recalled Peter Mayle’s Provençal memoirs filled with the heady scents of lavender and truffles, long meals outside, and the very prescribed ways of the locals. Perhaps one day I’d return with my husband in the spring to see the lavender fields and explore. I missed him terribly and couldn’t wait until Tuesday when we’d be reunited in Paris, though I was fully enjoying a day exploring on my own. Arles’ market is purportedly the largest in Provence, and people streamed by with full baskets and carts. I fell in with the clusters of people walking toward the Boulevard des Lices to see for myself. The market was bustling with vendors selling: fresh and dried fruits heaped in baskets; vegetables piled up in orderly little rows; oily, plump olives in short wooden barrels; wheels of cheese with wedges cut to reveal their firm smoothness or creaminess inside; salami of various lengths and shades of red; breads of every shape and size with hard, crusty exteriors concealing their soft, chewy insides; finely powdered, colorful spices in ceramic bowls or flowered cloth sacks with the sides rolled down; jars of fresh honey in neat little rows; enormous, wide metal pans of steaming yellow paella filled with seafood; traditionally patterned yellow and blue table linens; market baskets of every shape and color; little bags of dried lavender; and colorful rectangles of handmade soaps that looked like jewels. I wanted to buy everything, to gorge myself; but somehow felt a bit shy not speaking the language, perhaps because it was so crowded with locals intent on their weekly tradition. Looking back, I wish I’d taken some photographs, but I wanted the day to be about experiencing the moment, not overly focused on documenting it. The bar and restaurant terraces lining the street were full of patrons watching the parade of shoppers, showing each other their finds, and soaking up the sun. The stalls of delectable food soon gave way to jeans and handbags as I followed a lane back toward the center of town. An open doorway led down a short passage, curious, I explored, ready to retreat quickly if needed. It opened onto a beautiful courtyard filled with flowers, a low, round fountain at its center, framed by a white and yellow portico. 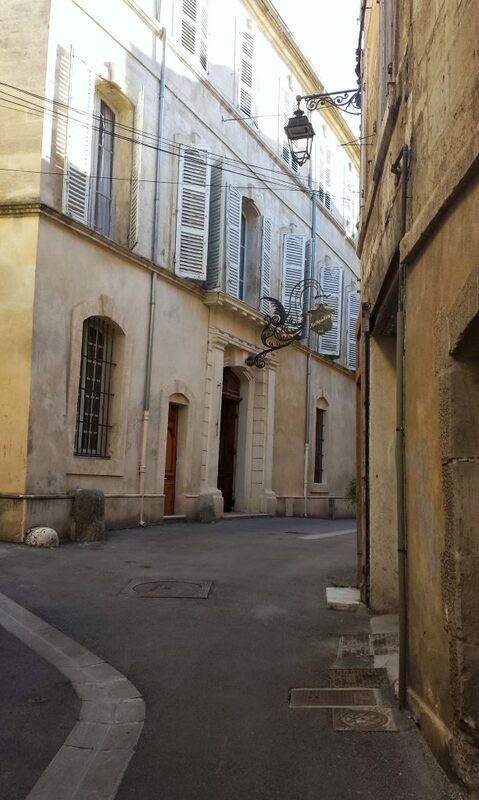 I recognized it as the courtyard of the asylum where Van Gogh was taken after he cut off his ear and painted The Courtyard of the Hospital in Arles. 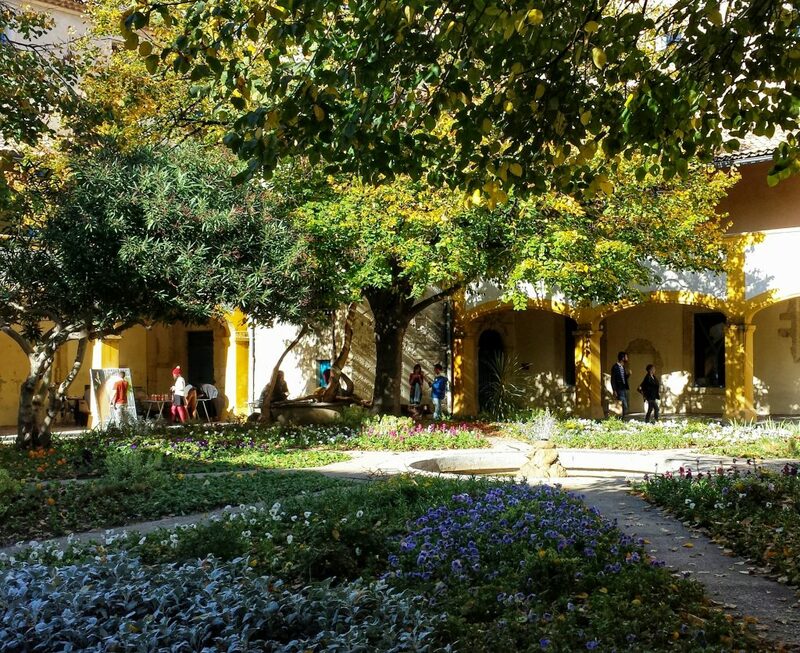 No longer an asylum, l’espace Van Gogh was abuzz with artists painting at their easels, women setting a long table under the arches for a feast, and a toddler discovering flowers. There was something amazing about standing there and comparing it to the way he saw and represented it. No matter that they had reconstructed the garden; it was still breathtaking to be in this place where the great artist had convalesced, to feel the echoes of his troubled soul, and see it turned into a beautiful space to honor both him and the artistic spirit. In the gift shop, I bought some cards and a few magnets. Perhaps a bit kitsch, my growing little refrigerator magnet gallery brought me joy, reminding me of great works of art I’d seen on various travels. After seeing so much lovely food in the market, I was ready for lunch and returned to the Place du Forum. The yellow cafe’s terrace full, I took a table on the adjacent terrace and enjoyed a simple lunch of an omelette, salad, and sparkling water. The square was quite small, its center paved over and full of cafe tables. Though it was November, due to the mildness of the climate, the trees still had leaves. Over coffee, I took out a card I’d just bought and wrote to my mother. Years earlier, when I was nineteen, we’d seen our first Van Gogh together at the National Gallery in London. It was long before I knew of travel guide books and was still the pre-internet era, and so I had no idea of the treasures the museum held. We turned a corner in a gallery and were greeted by his golden Sunflowers, which seemed to glow illuminated by a strategically placed light. We stood there for a long time, clutching each other, tears streaming down our cheeks, each knowing what it meant to the other. It’s a day I’ll never forget, alone with her in London, discovering, laughing, and crying for joy. How she would love to see the yellow cafe and courtyard. One of the downsides of traveling alone is experiencing things you wish you could share. Off the beaten track I found myself alone, meandering down narrow lanes flanked by medieval and Renaissance buildings. Everyone must have been at the market or lunch. 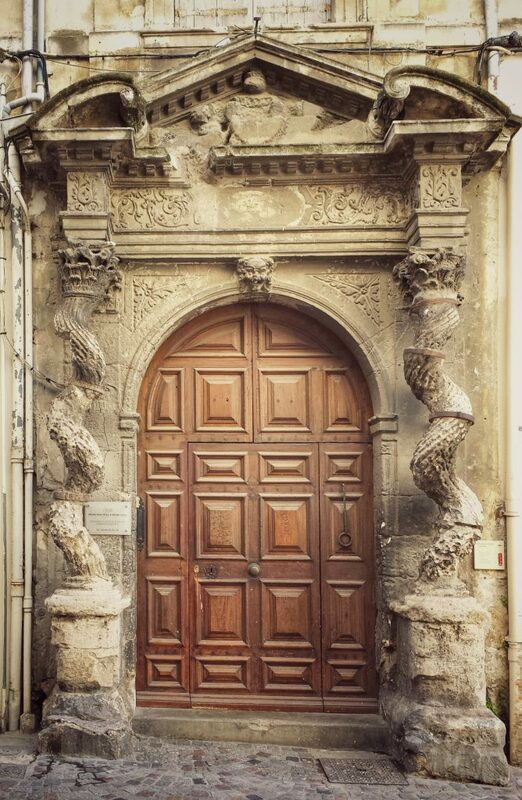 I enjoyed studying the textures of the stones, the pastel-painted stucco, pale blue shutters that echoed the sky’s hue, the angles of the shadows, and an occasional fancy door. 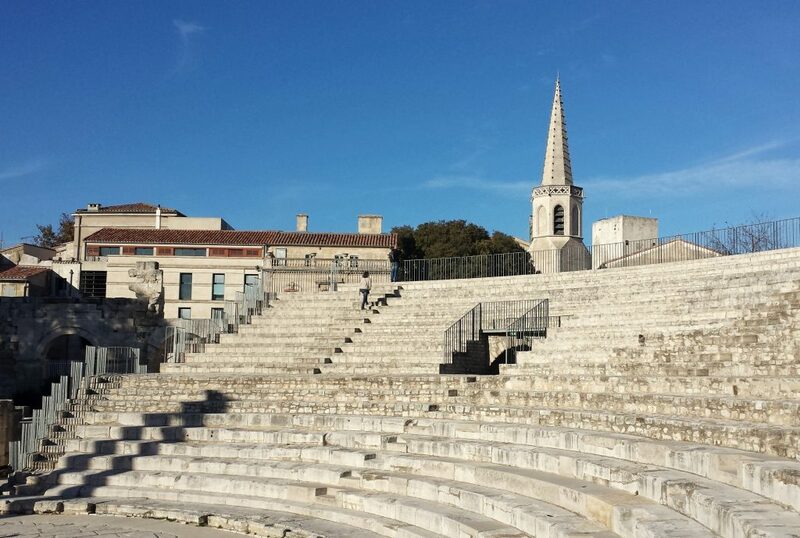 My plan was to make my way to the Arles Amphitheatre, but I first came upon the remarkable Roman Theatre of Arles, which was a complete surprise. I’ve since read it was built anywhere from the latter years of the first century B.C. 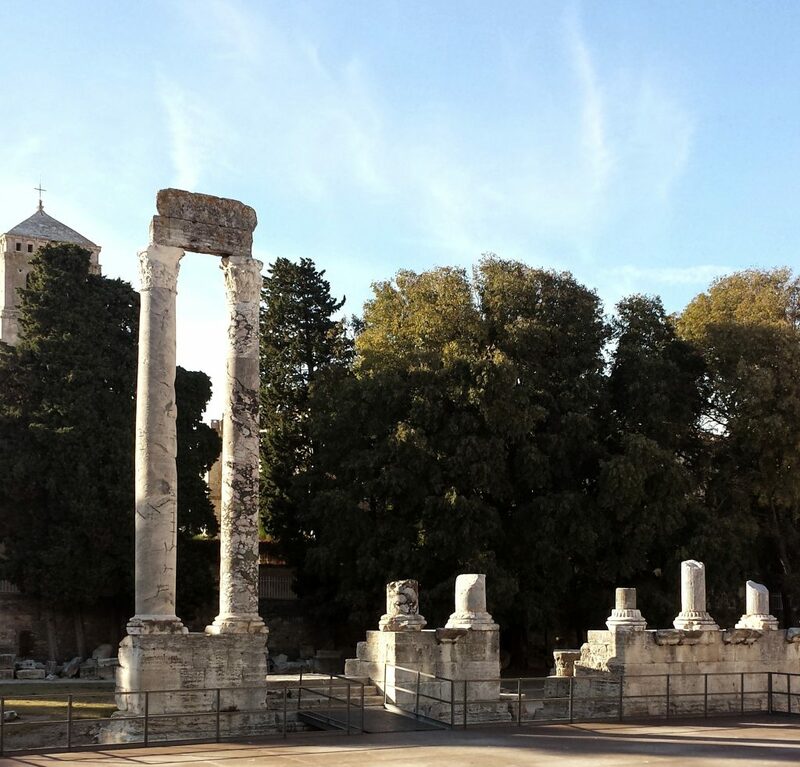 to the early part of the first century A.D. and could seat between 8,000-10,000 people. Over the ages the community pillaged stone from it to build the town wall and churches; however, the curved seating was almost entirely intact, built of white stone grayed by two millennia of grime and moss. It being November, there were only a handful of other tourists milling about. Remnants of original marble columns flanked a recreated stage. I sat in the stadium and tried to imagine what it would be like to watch a play 2,000 years ago, probably in a toga, the stands full. The ancient and the present coexist in Europe in ways rarely experienced in the U.S. 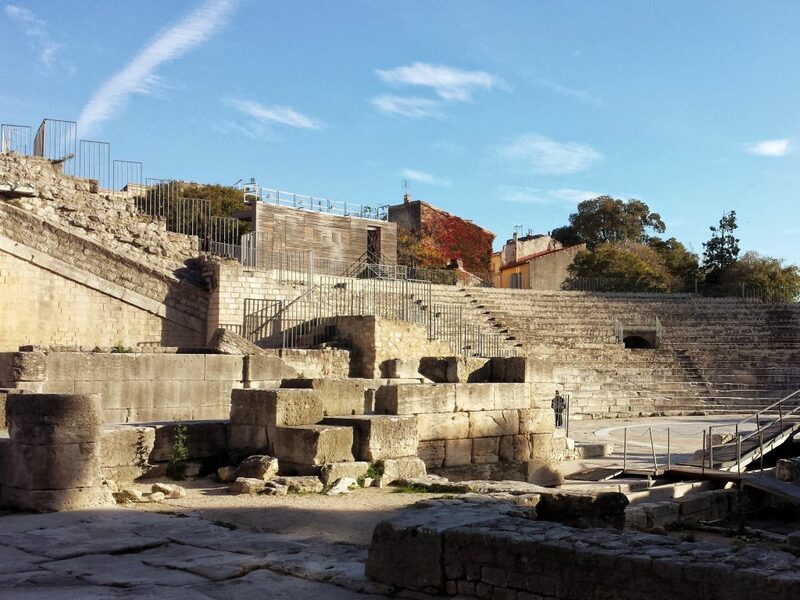 It was surreal to see the medieval and Renaissance buildings rise around the theatre, and the amphitheater looming large in the near distance. What would the Roman houses have looked like? Were they buried underground like the hidden streets and apartment houses in Rome? I wandered around enjoying the big blue sky and exploring stones. 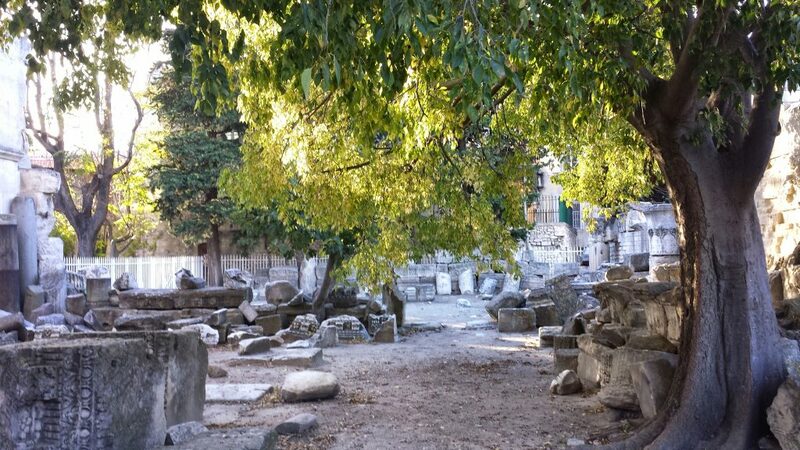 At the back of the complex there was a sort of graveyard for marble remnants and rubble. The excavated antiquities are in the Arles Museum of Antiquity, which I will put on my list for next time. My interest in the ancient world piqued, I headed up and over the little hill toward the amphitheater which looked like a smaller version of the Colosseum. The white arches rose high and framed the blue sky. 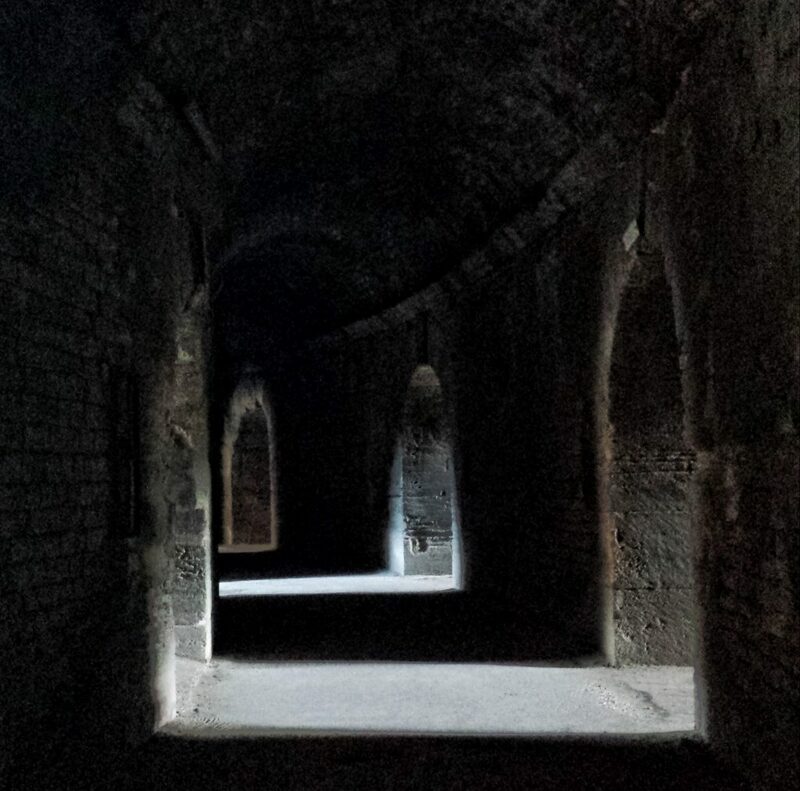 Finding myself alone again, I walked the dark, sinister feeling vaults beneath the Amphitheatre looking for the way in. I could sense the anticipation of gladiators readying for battle, and hear the roar of 20,000 people above, anxious for the show to begin. Real or imagined, it was spooky. Once inside, my view of the town of Arles blocked, all I could see were the arches against the sky and a few wispy clouds. Sitting down, on the bench I found a tiny, loose stone flake, no larger than my pinky finger nail, a miniature fossil of an animal impressed on one side. It was a good reminder that although people had a 2,000 year history with this structure; the stones were millions of years old and held the memories of entire ecosystems past. 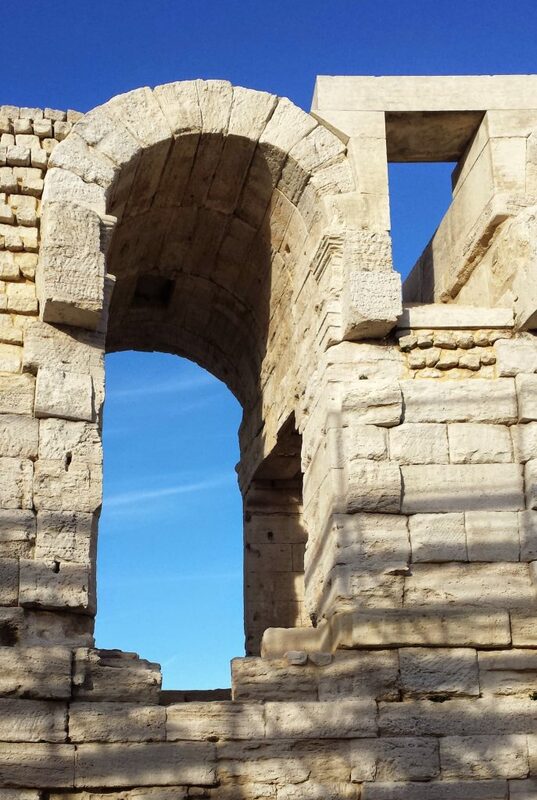 Over the centuries, after the fall of Rome, the community of Arles tucked itself inside the amphitheater as a fortification and built 200 houses. 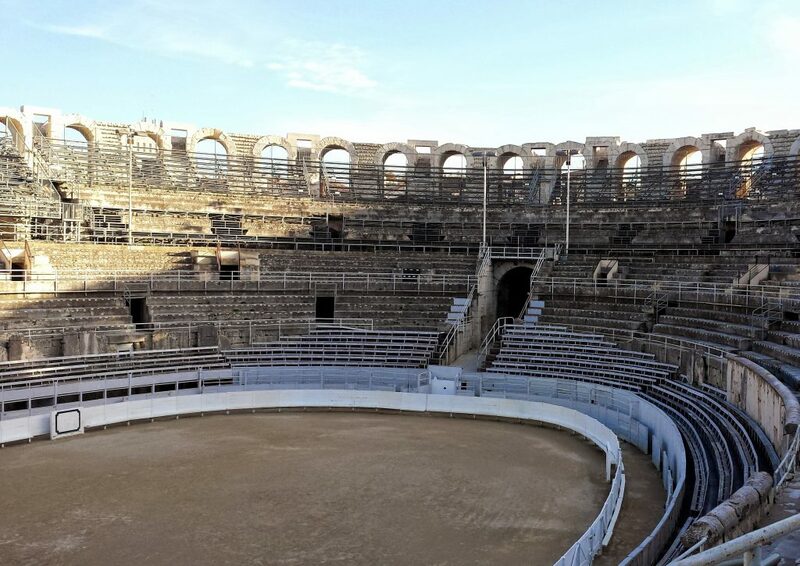 Today the structure is still used for bullfights, concerts and plays in the summer months. It was almost three in the afternoon. Wanting to get back to Montpellier while it was still light, I traced my way back to the main square, and from there, past the little carnival, now in full swing, and on to the train station. 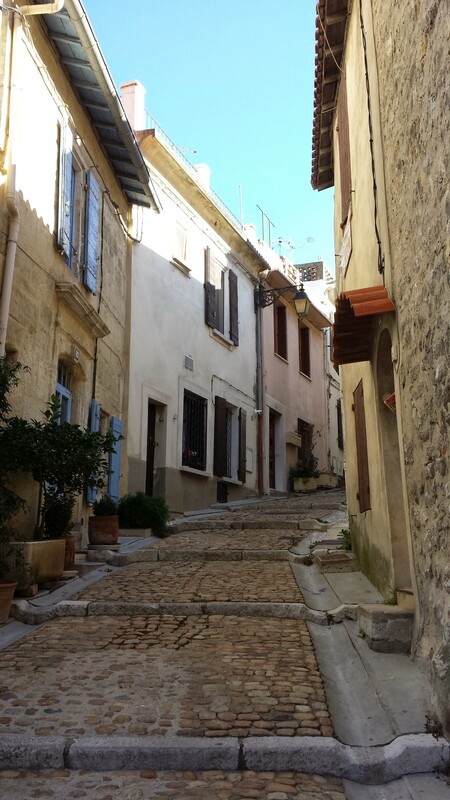 It was a short day trip to Arles, but I made beautiful memories to treasure. Hopefully, I will return someday, as there is much more to explore in this beautiful town. 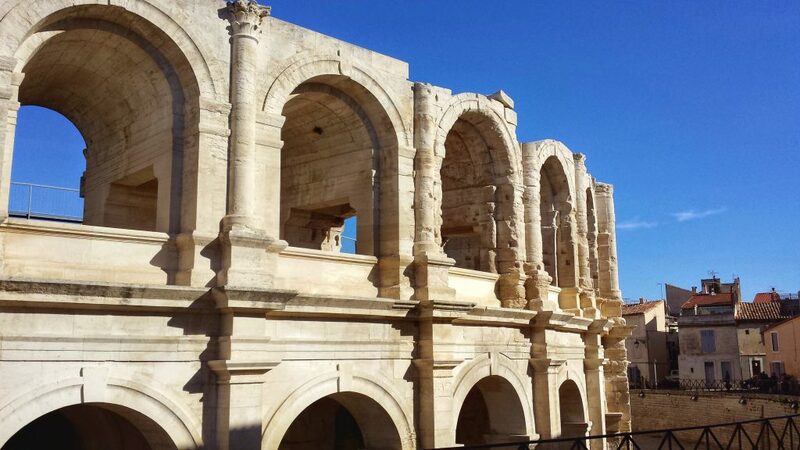 The Arles Office of Tourism website offers a comprehensive view of the ancient sites, museums, exhibitions, events, markets, festivals, and general goings on in Arles. Van Gogh Route is a wonderful website that maps out where the artist lived and created. Organized by city, each interactive map plots out the sites depicted in his paintings. In 2015 the Fondation van Gogh renovated a mansion close to the Place du Forum and entered a partnership with the Van Gogh Museum in Amsterdam, who now lends paintings by the artist regularly. I’m happy there is now an opportunity to see his work in Arles, and perhaps even a painting or drawing he created there. I’m so glad you enjoyed it, Melinda! Yes, it’s a challenge as an artist wanting to be both in the moment and a slightly removed observer framing and memorializing it. Thank you for sharing your visit to Arles! I always enjoy tagging along, and feel that, in some small way, vicariously experience the energy that you did. And, I know just how you feel about photographing your journey. I want both to photograph everything, every moment, as well as not photographing anything at all–just to be present. It’s a challenge! Looking forward to more of your travel memories!